The world's most iconic skylines are going green. Nineteen city leaders from the C40 coalition signed the Net Zero Carbon Buildings Declaration on Thursday to ensure all new buildings operate with a neutral carbon footprint by 2030. The mayors of Copenhagen, Johannesburg, London, Los Angeles, Montreal, New York City, Newburyport, Paris, Portland, San Francisco, San Jose, Santa Monica, Stockholm, Sydney, Tokyo, Toronto, Tshwane, Vancouver and Washington, DC also pledged to ensure all buildings in the cities—old or new—will meet net-zero carbon standards by 2050, according to a press release. The cities are home to 130 million people combined. Vertical farms have been touted as a way to feed a rapidly urbanizing world population (I've waxed poetic about them myself.) Critics of the trending technology, however, contend that these energy-intensive hubs are too costly and perhaps impractical to maintain. Sure, the naysayers have a point, but what if vertical farms did more than just feed mouths? In Stockholm, Sweden, the Plantagon CityFarm located in the basement of the iconic DN-Skrapan building in the Kungsholmen district has a whole other purpose besides nourishing the office workers on site—the farm also recycles its heat to warm the offices above. Denver is the latest city to mandate rooftop gardens or solar installations on new, large buildings, joining San Francisco, New York, Paris, London and other cities around the world with similar green roof measures, the Associated Press reported. The Colorado capital ranks third in the nation for highest heat island and eighth in the nation for worst ozone/particulate pollution, according to the Denver Green Roof Initiative, a grassroots group that advocated for the city's green roof ordinance, Initiative 300. 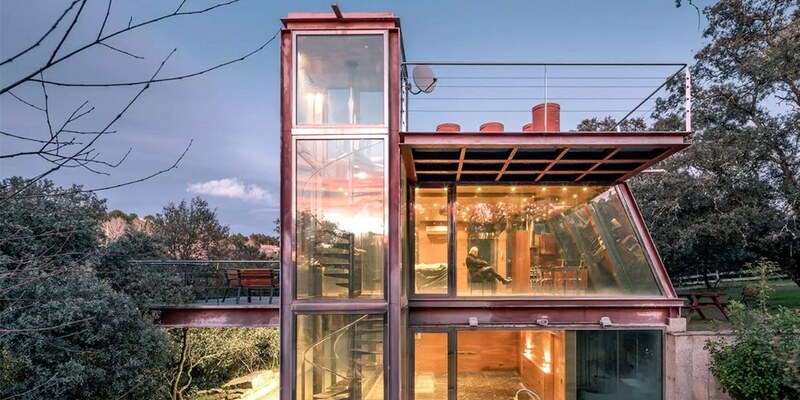 Many people might balk at the idea of living in a home that's the size of a treehouse, but Tesla, Inc. just created a tiny house fit for its larger-than-life CEO, Elon Musk. The Tesla Tiny House is currently being towed on the back of a Model X around Australia to exhibit the company's products and to teach the public how to generate, store and use renewable energy for their own home, according to Electrek. Is America Ready for a Nation of Tiny Houses? Late last year, the tiny house community celebrated a watershed moment—an official appendix in the 2018 version of the International Residential Code, the model building code used by most jurisdictions in the U.S.
"There are many things that are monumental in the adoption of tiny house construction codes by the IRC," cheered Thom Stanton, the CEO of small space developer, Timber Trails. "Among them, that architects, designers, builders, community developers and (maybe most importantly) zoning officials have a means of recognizing tiny houses as an official form of permissible dwelling." The largest vertical garden in the world looks like a living, breathing green giant in Bogotá, Colombia's densely populated capital. The climate crisis is a problem caused by humans that can be solved by humans. These three cities are proving it. While a lot of media coverage around the crisis is doom and gloom, cities around the world are coming up with powerful solutions on the local level. Here's how a Canadian city, an American city and a Chinese city are taking on climate action. It was love at first sight for Richard and Robin Kinley. But it took a sunset to seal the deal. The Kinleys, both 59 and living in Atlanta, visited southwest Florida in January to look at Babcock Ranch, a planned community that could become the most sustainable town in America. 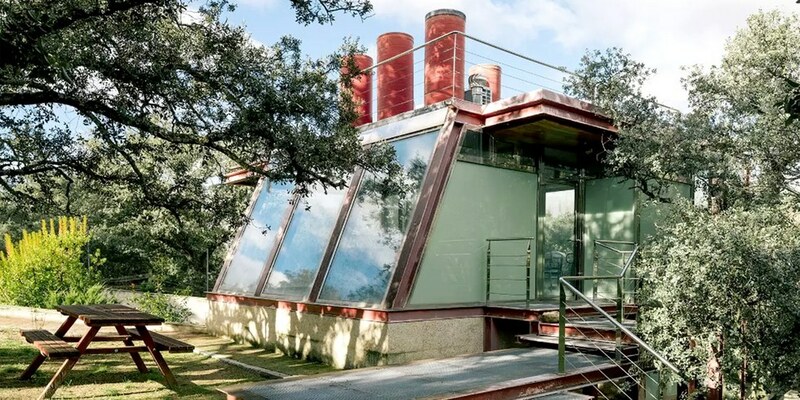 From transforming shipping containers into homes to reassembling them into vivacious greenhouses, there is a lot one can do with the apparatuses. But construct a gorgeous hotel? Why not. Copenhagen International School's new building in the Nordhavn district features the largest solar facade in the world. The 12,000 solar glass panels can generate 300 megawatt hours of electricity per year, more than half of the school's annual energy needs. After much anticipation, the pre-K to 12th grade campus opened last month. The unique sea-green hue of the panels was created by the research institute Ecole Polytechnique Federale in Lausanne (EPFL) after more than a decade of development. By using the process of light interference, the researchers achieved the tiles' distinctive color without using any pigments and without reducing energy efficiency. Students are excited about the school's environmentally friendly features such as the individually angled solar panels, the numerous windows that let in plenty of natural lighting, as well as the green roof. "It means so much to me that the school is moving to a new campus that is committed to sustainability," said Copenhagen International School director Jennifer Weyburn. "The kids can learn things about sustainable solutions for the future." The vegetables and fruits growing in the greenhouses can be eaten and can "teach kids where food actually comes from," said 12th grade student Aoife Sweeney. The color of the panels are a technological feature in their own right. The solar facade has a total area of 6,048 square meters, making it "one of the largest building-integrated solar power plants in Denmark," according to the designers at CF Møller Architects. "The researchers' aim was to be able to define the color of their solar panels—such as brick red, royal blue, golden yellow or sea green—by ensuring that only certain wavelengths are reflected. This required a series of digital simulations and a special manufacturing process, and it took 12 years to get from the first sample to the first colored solar facade. The researchers developed special filters, which they applied to the glass panels in nanometric layers. The filter design determines which wavelengths of light will be reflected as visible color. The rest of the sunlight is absorbed by the solar panel and converted into energy." Denmark's capital, Copenhagen, is one of the world's greenest cities. It aims to become the first carbon neutral capital by 2025. In December, the city announced plans to shed coal, oil and gas from the city's 6.9 billion kroner ($1.1 billion) investment fund. 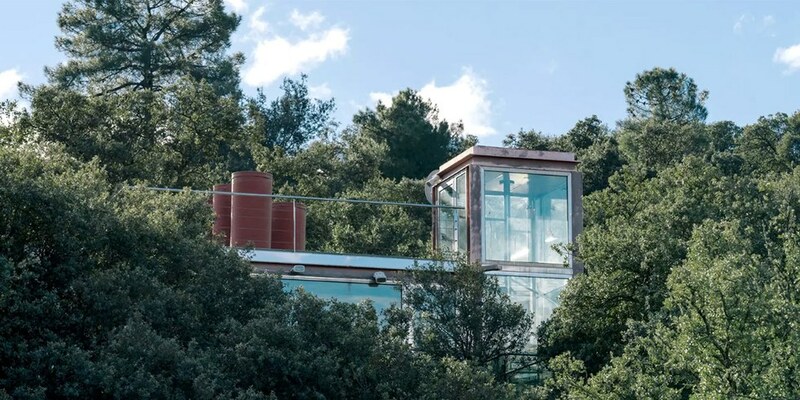 Forest lovers will appreciate the beautiful modern glass home recently built in a secluded glade near Madrid. 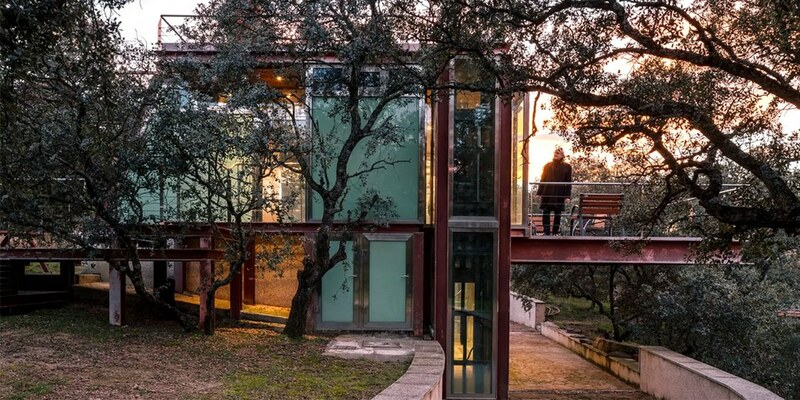 Penelas Architects' Hidden Pavilion was completed in 2016 in a quiet forest just northwest of Spain's capital city. The Hidden Pavilion has a total floorspace of 70 sq m (753 sq ft). The Hidden Pavilion was designed by Penelas Architects. The Hidden Pavilion is surrounded by trees. 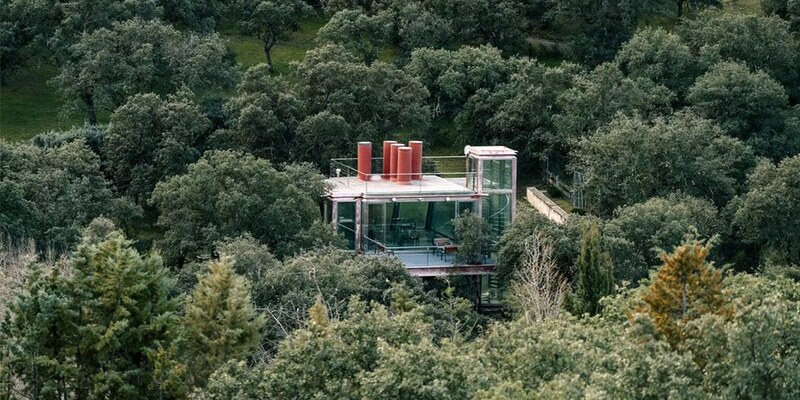 The Hidden Pavilion is located in a forest northwest of Madrid, Spain. The Hidden Pavilion's veranda cantilevers over a waterfall. The Hidden Pavilion is topped by a rooftop terrace. View toward the Hidden Pavilion's veranda. The Hidden Pavilion is a minimalist but attractive two-story home designed to accommodate human residents and surrounding trees. 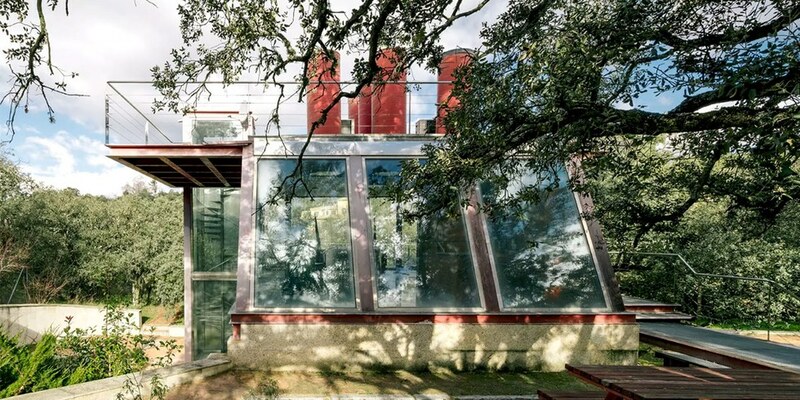 The second floor is carefully angled to allow room for a 200-year-old holm oak so it can continue its life unimpeded. The structure also includes openings in the roof terrace and veranda that allow younger trees to spread out. The 753-square-foot Hidden Pavilion has a bedroom, bathroom, patio and large closet on the first floor, and a kitchen and dining area on the second floor. The floors are connected by a spiral staircase. 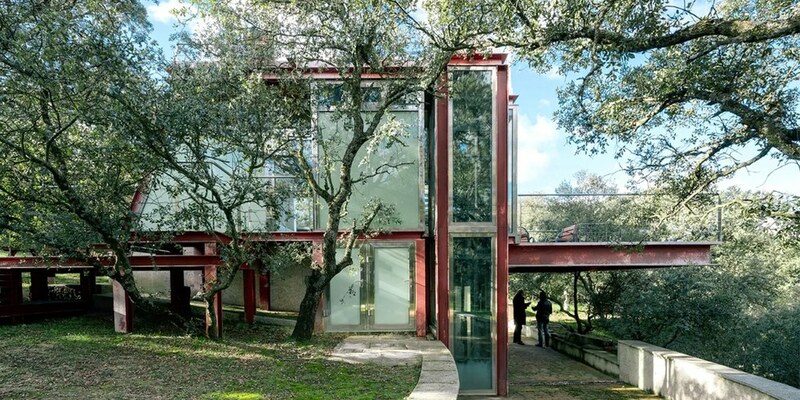 The basic structure of the house is made of steel and the interior areas that aren't glass are cherry wood. The walls are mostly made of glass to encourage immersion in nature and there are currently no window coverings. 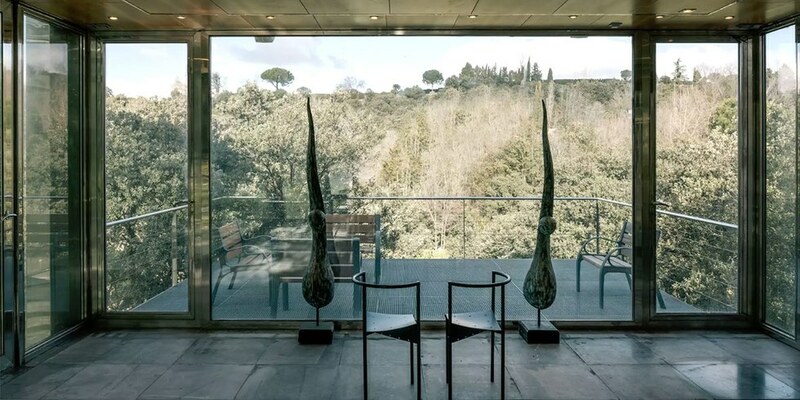 While the forest encompasses much of the house, a trip to the rooftop veranda offers panoramic views of the local environment. In addition to the open roof, there is a spacious second-floor veranda that perches over a small waterfall. Chimney-like tubes in the ceiling encourage light to travel into the home, which is mostly shaded. The Hidden Pavilion was designed "as a secluded place for meditation," and "to instill a sense of nature," Design Boom shared. Construction began on the Hidden Pavilion "some time ago," head architect Dr. José Luis Esteban Penelas told New Atlas. It paused in 2010 and was completed in 2016. 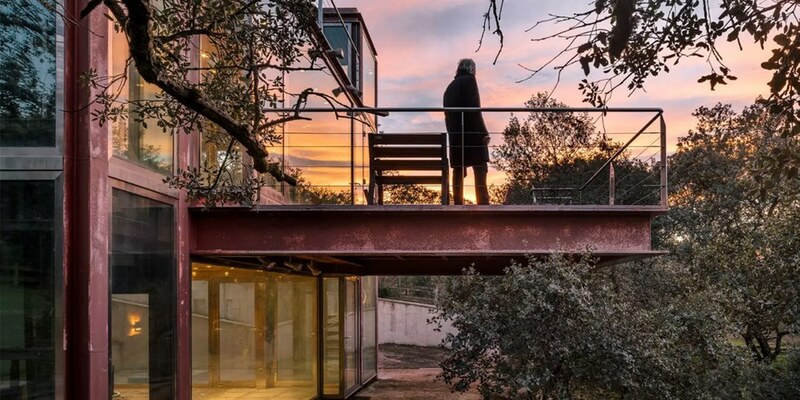 Penelas appears to have achieved a delicate balance between the needs of human habitation and a desire to honor and appreciate the natural environment surrounding the home. Penelas Architects is based out of Madrid and Penelas teaches at the European University of Madrid. His other notable projects include Juan Carlos Park and the plaza for the Reina Sofia Modern Art Museum.